I've long been an admirer of the .22 WMR in general and in the North American Arms Mini-Revolvers, specifically. In times past, the .22 WMR has been limited by the lack of good self-defense ammunition. That situation has changed dramatically, with the introduction of the Hornady Critical Defense and Speer Gold Dot loads. 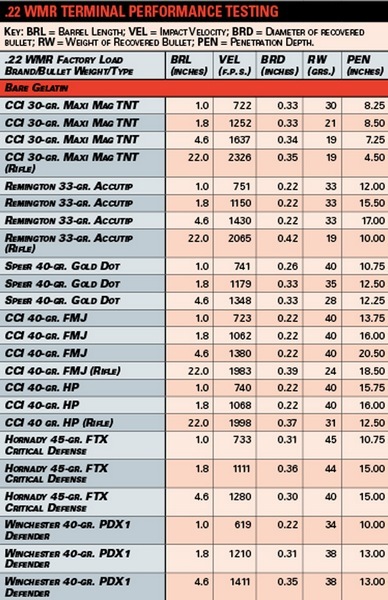 The Hornady .22 WMR Critical Defense load, (45 grain FTX® Critical Defense®) has proven to be a standout. The following ballistics, courtesy of the NRA, should raise a few eyebrows. Fifteen inches of gel penetration is impressive, as is expansion (deformation) in the area of 30 – 36 caliber, with muzzle velocities at 1111 fps (1.8 inch barrel) to 1280 fps (4.8 inch barrel). This should convince you to opt for the 2 inch barrel NAA Black Widow or the 4 inch NAA Mini-Master as opposed to the tremendous velocity and penetration loss you'll have with a 1 inch barrel. 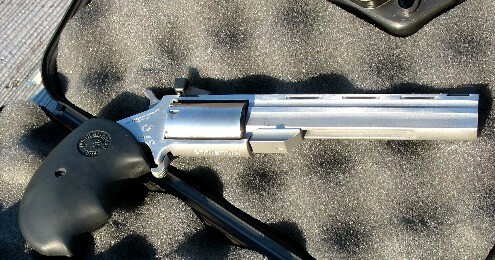 There are significant negatives with such platforms as a .44 RemMag snub-nose revolver, for example. Fire one indoors in low light, you'll be temporarily deaf and blind. Diminished awareness and temporary disorientation is exactly what you don't need when forced to use a firearm for the defense of yourself or others. While everyone's tolerance for bulk, concealibility, recoil, and muzzle flash is different, the gun that is with you is of infinitely more value than the one that is not.